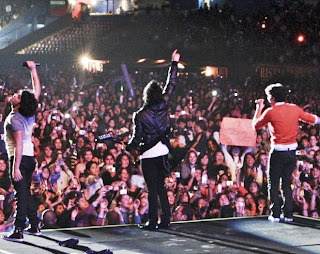 Jonas Brothers interview with MyKindaPlace: What's the best freebie you've ever been given? Nick: Whenever meals are taken care of, that always a good one. Kevin: Yeah, sometimes we'll go to a restaurant and people will just pick up the tab for us! Nick: Yeah a fan will just pick up our tab and it's like, shocking! so that was pretty big! Nicest celebrity encounter? Kevin: Celine Dion. She was awesome, she was so complimentary and super-sweet and super-nice. Joe: Matt Damon. He was so nice, he even prayed before we went on stage with us, and just hung out with us and stuff. He was so cool. Which celeb reality show would you do if you had no choice? Joe: I'd do Amazing Race which is this thing in the US where you have a partner and you have 80 days to go around the entire world, and you just run with backpacks and stuff. And there's teams of like six or seven people. Nick: Yeah they usually do it with like a struggling couple and it's how they bond. It's amazing! Joe: I'd do it with my best friend John. Nick: Yeah it'd be cool to do it with a best mate. Or we'd make quite a good team together too! Would you ever get your kit off and pose in the buff, and if yes, how much? hours or something, but if I know I've got to get up early in the morning I'll just choose not to! I feel good though! He says I just walk around in my hotel room! Joe: You do! I'll wake up and just see feet walking around or something!